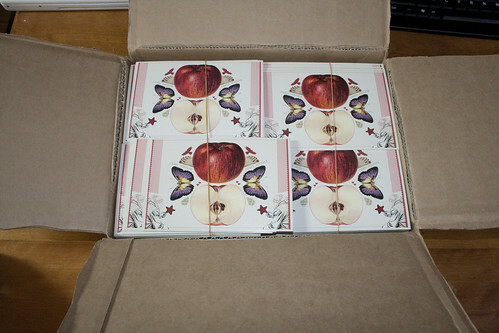 A happy little package arrived this week containing 500 postcards of a collage I made, printed by Avant Card. 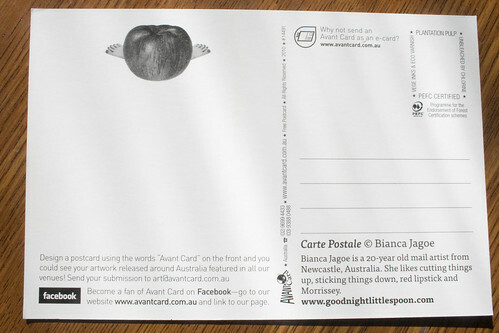 If you're not familiar with Avant Card, they are an Australian company that prints promotional postcards for businesses (for a fee) which sit in free postcard stands all over Aus. 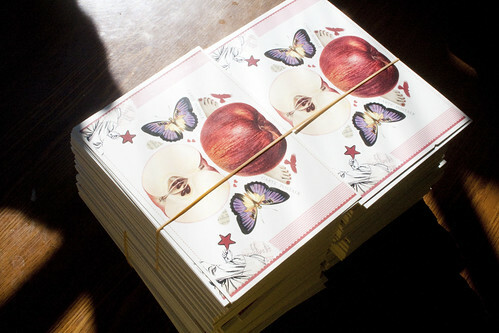 However, they also run an artists programme wherein they ask people to submit their artwork, and if chosen, they print a limited run of them, which sit in free postcards stands around Australia for anyone to pick up. 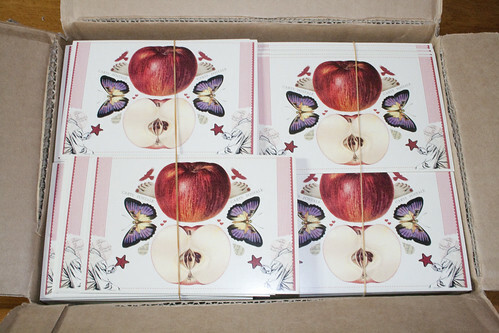 The stands are everywhere and often contain the loveliest postcards. 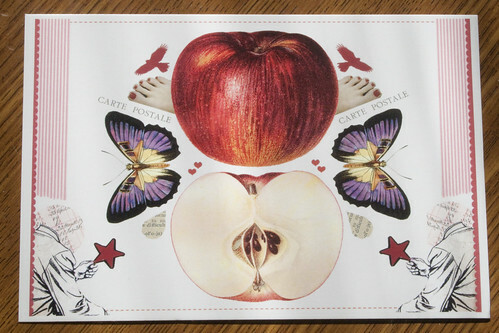 I have picked up, kept and shared so many of these postcards (if you're one of my penpals, I'm sure I've sent you some! ), and I am so happy to get to be a part of this programme. They do a print run of up to 20,000 of each design, and send each artist 500 samples of their postcards, so I have a big bundle on my desk, waiting to be shared. Would you like one? 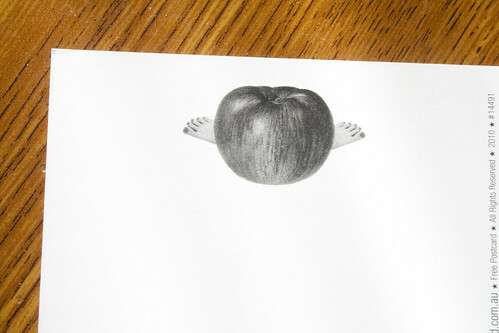 My pockets are a bit empty of late so I can't afford to send them everywhere for free, but if you're happy a pay a little for the postage, I will very happily send one (or a couple) your way. If you live outside Australia and would like me to send you one, scoot to my Paypal and donate $1.45 (if you'd like 1 postcard), or $2.20 (if you'd like more than one, up to 5). When you go to review your donation there's a little link in bold that says "Add special instructions to the seller" - this is where you're able tell me your address and how many you'd like. 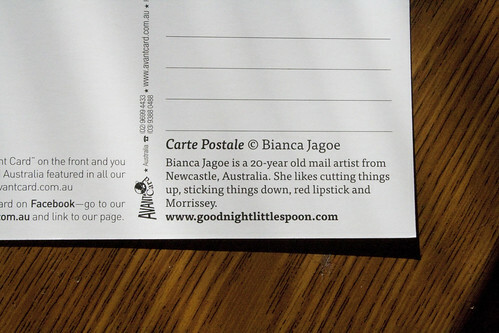 ($1.45 and $2.20 are postcard and letter postage prices in Australia). If you live in Australia and would like one, head to my Paypal and donate 60 cents, leave me your info and how many you'd like (up to 5) and I'll get one to you asap. ^ I really had no idea what to write for a blurb! I have acquired a rather unhealthy sleeping pattern lately. I wake up really late, realise I have course work to do, but decide I'll put it off until the afternoon, then I don't pick it back up until late evening, decide I need to get it done and continue into the early hours. Yesterday I went to bed at 6am, this morning I went to bed at 5am. It's awful, I hate doing it, but my body clock has adjusted to this schedule and it will take a fight to get it back to reasonable waking/sleeping hours. Tomorrow C and I are going to inspect another house (if I can wake myself up in time!). This one is a terrace right in the city, situated across the road from Officeworks (beloved office supplies store), in clear view of our favourite cafe, central to everything and with a bus stop outside. It's nothing amazing, but affordable and sweet and so, again, my fingers and toes are crossed that it falls into our possession. Though I am incredibly grateful we were able to move here, put our things into storage and house sit comfortably until we find a suitable house, I miss my own space, knick knacks, desk, kitchenware, bed, etc and am eager to set up. Today I bought a vintage dress that makes me look like a nun!